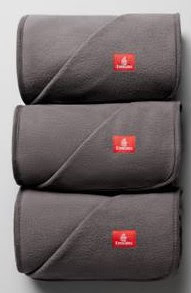 The Emirates has unveiled new sustainable blankets made from 100 per cent recycled plastic bottles, reports ITRealms. The soft and warm blankets, ITRealms gathered, were made using ecoTHREAD patented technology and is now available in Economy Class on all long-haul Emirates flights. Each Emirates ecoTHREAD blanket, ITRealms report, is made from 28 recycled plastic bottles. With the latest innovation, the bottles are recycled into plastic chips before being turned into yarn, creating a polar fleece material.The fine thread is then woven into soft blankets. In the last year, Emirates has added several new products for customers travelling in Economy including the world’s first interactive amenity kits. The amenity kits - filled with necessities such as an eye mask, earplugs, toothbrush and toothpaste, and socks – uses augmented reality technology to unlock entertainment on customers’ mobile devices using the Blippar app. The content was refreshed last month to feature a new interactive game called The Emirates Destination Dash to keep customers’ busy on long-haul flights or on the ground.